Beautifully crafted bathrooms, elegant tiling, plastic wall boarding, plastic ceiling boarding and bathroom accessories. Please click here for the Bathroom Gallery. 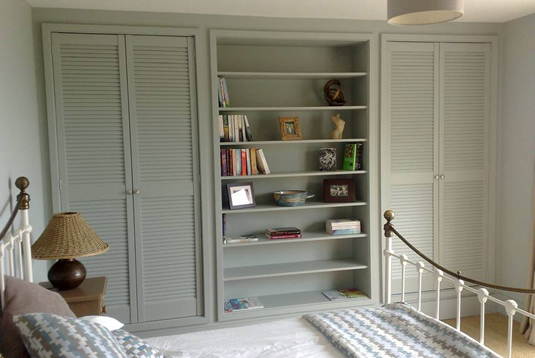 Fitted bedroom furniture and made to measure Stanley sliding wardrobe doors. Please click here for the Bedroom Gallery. Hand crafted bespoke furniture, wardrobes, kitchens, storage ideas and audio & visual storage solutions. 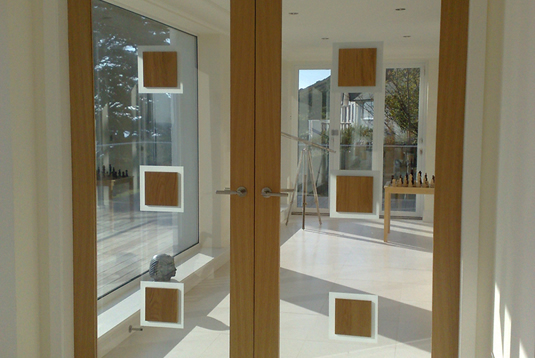 Please click here for the Bespoke Joinery Gallery. Carl Hughes Carpenter & Joiner has crafted some truly stunning and individual bespoke cabinets, sideboards, and display cabinets. Please click here for the Cabinet Gallery. The garden is like another room of a property – there should be a seamless transition from inside the home to the garden. Decking is the perfect solution for relaxing and entertaining in the garden. Please click here for the Decking Gallery. Picture rails, dado rails, architrave, skirting and finishing touches. Please click here for the Decorative Joinery Gallery. Internal doors, internal door frames, external doors, external door frames, architectural door furniture and locks. Please click here for the Door Gallery. Carl Hughes Carpenter & Joiner undertakes work to any type of wooden fence. Carl has undertaken fencing work to the perimeters of clients’ properties ensuring they had the best form of privacy, using stylish fencing. Please click here for the Fences Gallery. 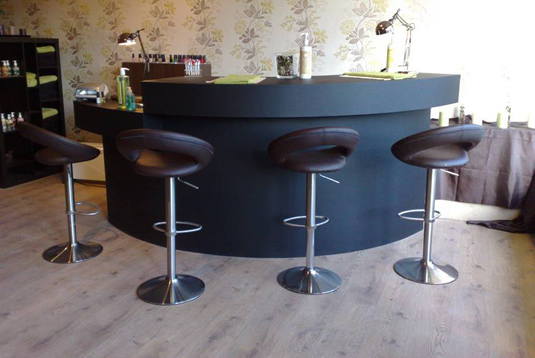 Solid wood flooring, parquet flooring and laminate flooring. Please click here for the Flooring Gallery. Carl Hughes Carpenter & Joiner’s experience in the field of designing and making bespoke wooden gates is an element he is really proud of. When clients commission Carl to design, manufacture and fit gates, the security, privacy and appearance of a property is enhanced. Please click here for the Gates Gallery. Carl Hughes Carpenter & Joiner designs, makes and installs home entertainment units to meet your individual requirements; whether you need a unit to accommodate a standard sized television to a 60″ television or bigger, satellite or digital television receiver, dvd player, games consoles, etc. Please click here for the Home Entertainment Units Gallery. 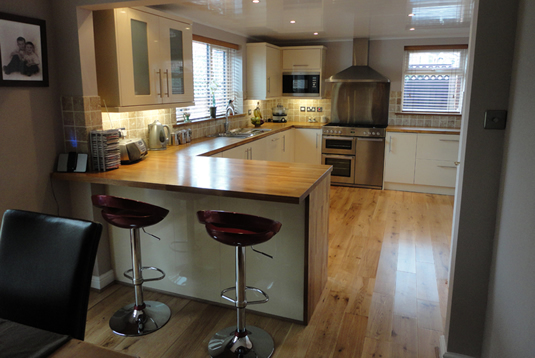 Hand crafted bespoke kitchens, fitted kitchens and made to measure kitchen door replacement service. Please click here for the Kitchens Gallery. 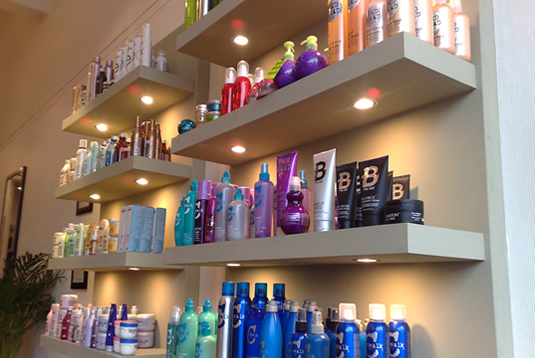 Hand crafted shelving & bookcases tailor made to customers’ specifications. 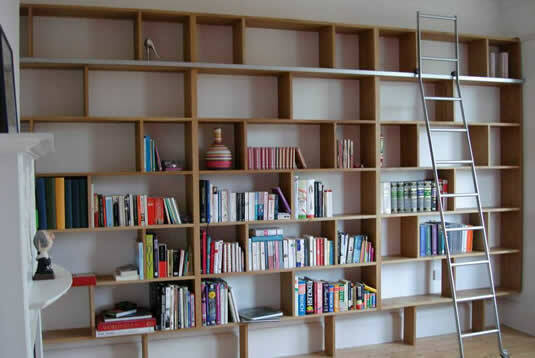 Have a look at the made to measure shelves and bookcases designed and handcrafted by Carl Hughes. Please click here for the Shelving & Bookcases Gallery. Carl Hughes Carpenter & Joiner considers a staircase is a real centre piece within your home. Carl can replace or repair your existing staircase, stair parts and balustrade system by offering traditional or modern, contemporary components. Please click here for the Stairs Gallery. With a keen sense of design, ergonomics, quality and value for money, Carl can design and install a study or office to ensure it includes everything you require from wall units, file drawers, shelves, cupboards, CD racks, even somewhere to store your stapler. Carl can include clever features, such as cable management solutions, pop up power sockets, discreet computer or laptop storage, whilst ensuring everything is logically positioned. Please click here for the Studies and Home Offices Gallery. Velux windows, sliding sash window restoration and window restoration. Please click here for the Windows Gallery. You can find out which areas we cover by clicking here.